David has provided an expert an imaginative approach to producing drawings for my business and highlighted regulations I had not considered. Highly recommended. I worked with David, whilst I was a Governor at Bardwell Special School, on various projects. Drawings, specifications and management were all to the highest standard, with the head teacher and board being kept well informed. Professional, knowledgeable and an excellent communicator. David is one of those professional people who inspires complete confidence, in their judgement and abilities. He is a good chap to work with, serious in his approach and generous in the time he gives to helping others. David has a great skill and ability to provide a professional design, accurate to the requirements without over engineering the project and applies a business minded approach combined with years of experience. His personal qualities of honesty and integrity shows throughout his work, David is pleasure to work with. David is the epitome of professionalism, and the results of his work speak for themselves. 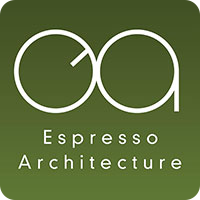 With a wealth of architectural excellence and people skills to boot, Espresso Architecture are the ones for any job large or small. I have had the good fortune to work with David on numerous projects over the years. David has always had clarity of vision throughout the design process and he has always striven to provide the client with a design that is different from the ‘norm’ and more than just the brief. David has never shied away from questioning the whys and wherefores as the detailed project design is developed and it is this refreshing “thinking out of the box” approach that makes working with David such a refreshing and enjoyable experience. I have known David for a number of years and have been very impressed by his dedication, diligence and attention to detail. I have found him to be a very trustworthy reliable person and can thoroughly recommend him.